This part of the High Street hasn't always looked as it does today - between No.134 and No.142 the arrangement of buildings has changed somewhat. Originally the various parts of Beaufort House, Cottage and stables occupied just the area between No.140 and No.142 High Street. 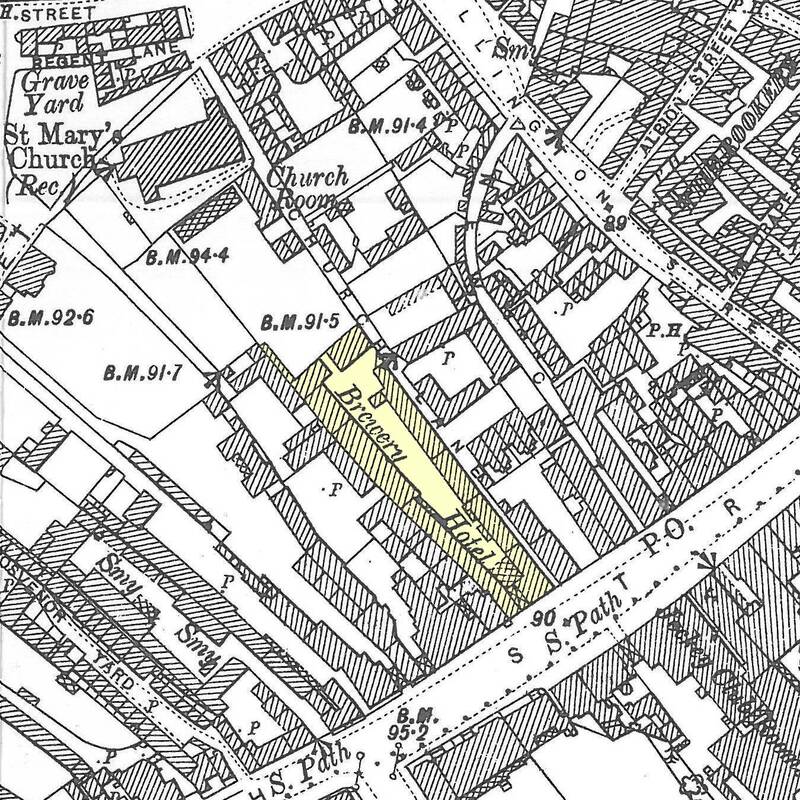 To the right of this on the 1891 census we have another building called Cavendish House, roughly occupying the area of No.136-No.138 High Street. 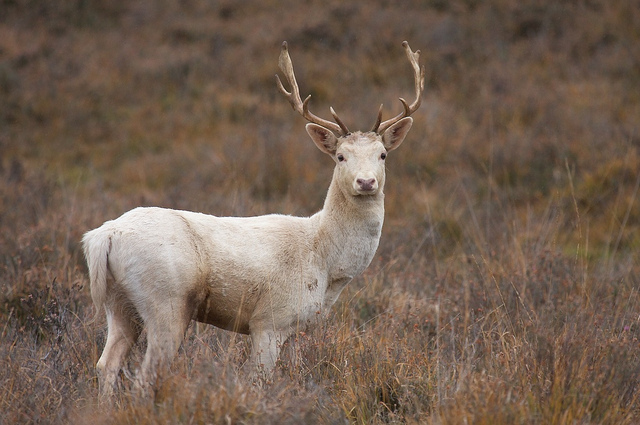 In the above photo you can see that the White Hart Office occupied the right-hand side of this. As with a many other sites in Newmarket High Street the reason for this somewhat drastic re-development is that the White Hart was the site of the seventh bomb, which struck Newmarket on February 18th 1941. 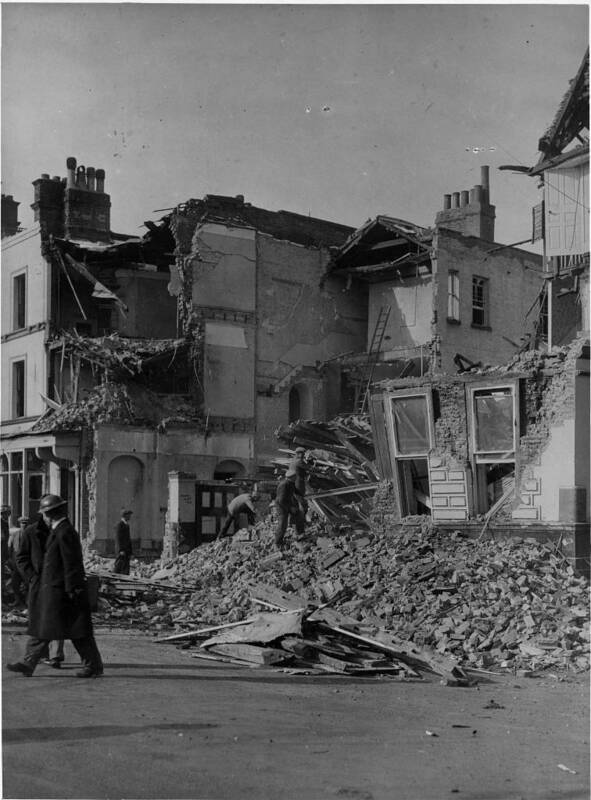 The hotel was very busy at the time and the damage was very significant; demolishing most of the front of the building. If you compare the two older photos above you can see that the change in the arrangement of buildings along here began well before 1941. Sometime after 1895 (presumably when the Star Brewery purchased the hotel - see below for details) the White Hart office, that had been in the right-hand side of Cavendish House, had its roof raised and its frontage painted in White and styled to match the remainder of the hotel. When the hotel was re-built after the bomb damage the far right-hand side against Church Lane became the present entrance into the rear courtyard. 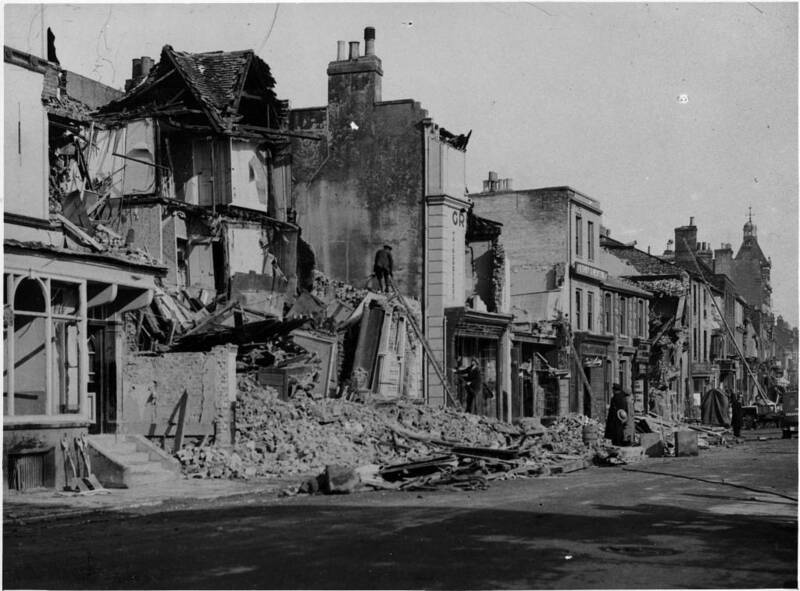 Not shown on this page, but Beaufort House also suffered some major bomb damage - the section against its courtyard entrance (in use at that time by Proctor fruiterer & florists) had been struck badly. It's not known if Beaufort House was changed after the bomb attack or before, but if you compare the building today to that shown in the 1895 photo above you'll see that it has been extended to right to fully consume the left-hand side of Cavendish House. The extension has been constructed in the same architectural style and brickwork to match the original building (which seems to have been re-built as was following the bomb attack) - so that today you cannot readily tell the difference between what was the original house and what is new. Following the bomb the White Hart hotel frontage was completely re-built, in a similar style, but subtly different to the architecture of Beaufort House, so that today this area looks all very consistent and deliberate - as detailed here the truth is somewhat more complicated. Following its re-build the White Hart has undergone further changes, the front door on the left is no longer used as the main entrance into the hotel and full glass windows have been added to the street frontage. 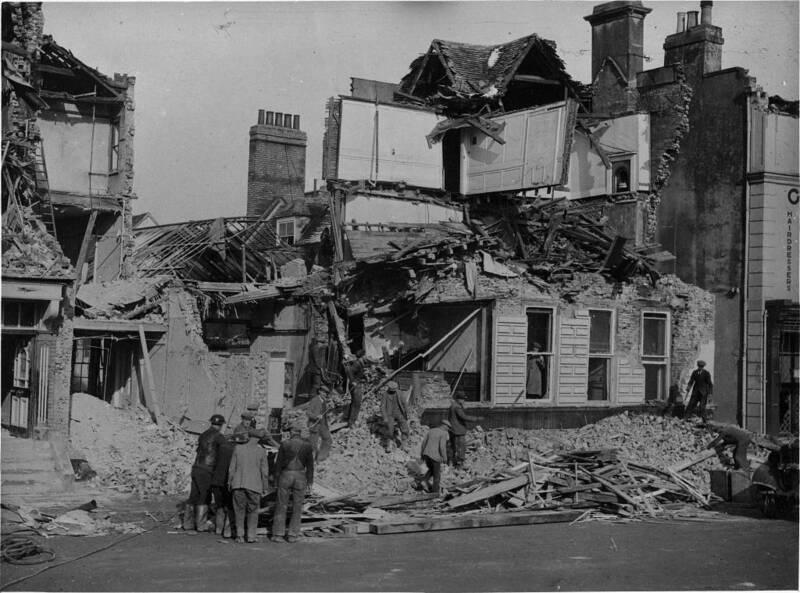 One of the few buildings that remained after the bomb attack was the hall at the rear of the hotel. At one time this had been used by the fledgling NOMADS dramatic society as a make-shift theatre. 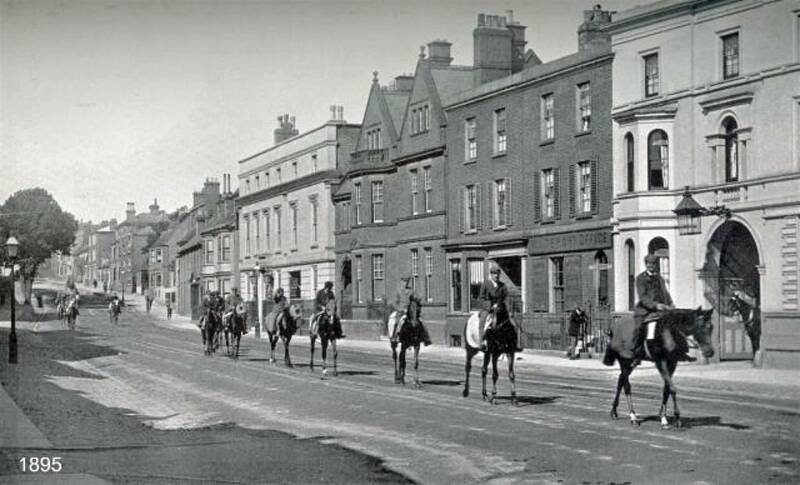 Charles Bottom seems to have been one of the key players in the history of Newmarket; as at one time he owned the house next door to the infamous Coffee Room and that both of these buildings eventually turned into being the Jockey Club - No.101 High Street. Further details about Charles can be found on the page for the Jockey Club, and also, because of its prestigious location, a painting of Mr. Bottom's House. Charles sold his house to the Jockey Club, which by 1832 they'd pulled down to eventually become a new part of that establishment. Charles clearly did rather well out of this deal as by the 1841 census he's listed as the Innkeeper of the White Hart and then by 1861 he's listed as a hotel keeper and farmer (the 1851 census for Newmarket St Mary's is missing). Charles was born in Newmarket and baptised at St Mary's on 3rd July 1805. He married Mary Smith by license on 18th July 1831 in Mary's home town, at Cambridge All Saints. 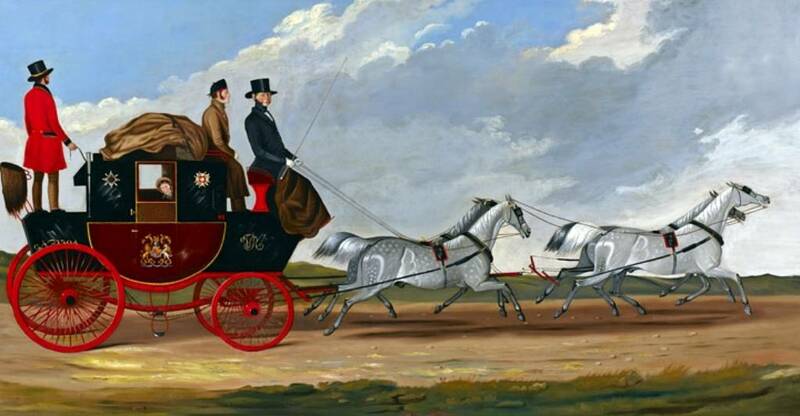 During the eighteenth century travel by stagecoach became common. All the principal inns and hotels provided changes of horses corresponding to the posting stations. 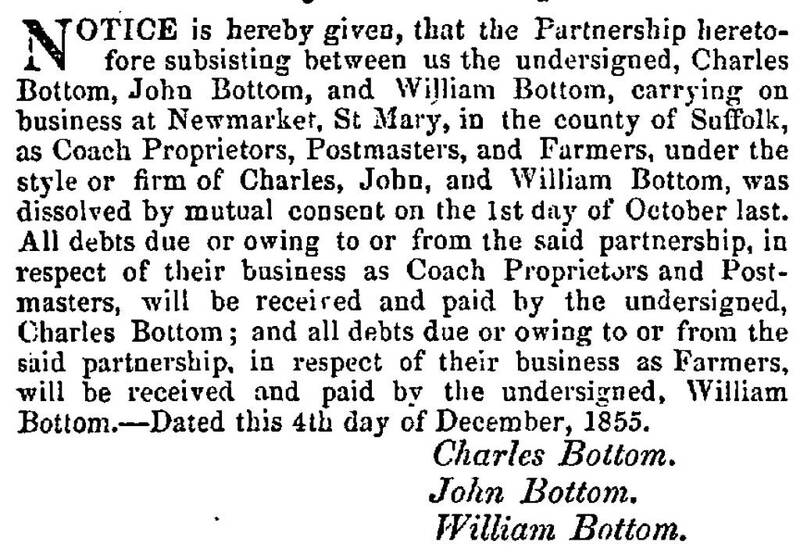 As detailed on the page for No.43-47 High Street, in the discussions of the railway coming to Newmarket, in 1845 Charles Bottom was the postmaster at the White Hart Inn. Charles died on 6th October 1866. 2 years after Charles' death in 1868 his widow Mary transferred the White Hart to Benjamin Chennell, retiring from the hotel business and moved across the road to Cardigan Lodge - No.113 High Street where on the 1871 census she can be seen living next door to the famous equestrian artist Harry Hall who was in 'The Glen'. 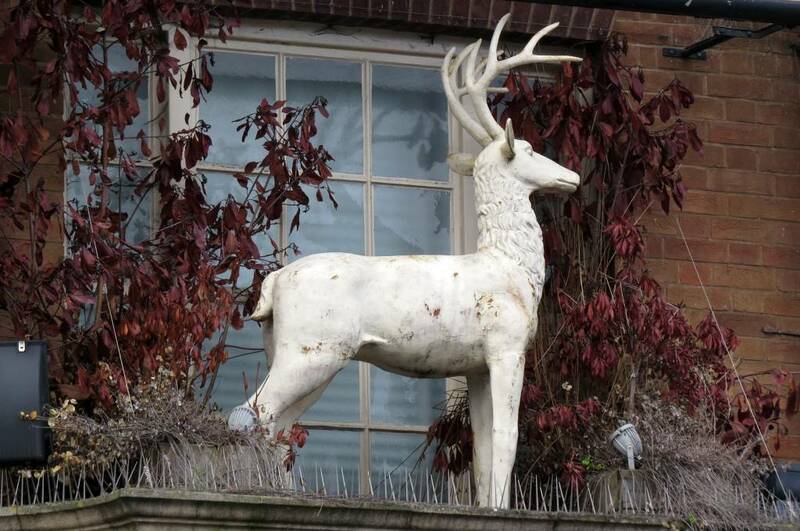 Harry had his artists studios right next to the White Hart on the other side of Church Lane. Their friendship seems to have continued as by the 1881 census both Harry and Mary had moved to retirement houses in Upper Station Road (now Old Station Road), part of the Rous Memorial hospital. Harry died soon after on 22nd April 1882, but Mary lived on until her eighties and died on 31st August 1896 leaving the considerable sum of £21,349 2s 8d in her will. Benjamin Chennell was born in Guildford, Surrey in 1835 to Thomas and Katherine Elizabeth Chennell and baptised at Guildford, Holy Trinity on 25th December 1835. In 1841 and 1851 he was in Stoke next Guildford, Surrey living with his parents. He married Elizabeth Sarah Snell on 27th April 1859 at St Michael's, Stockwell, Surrey and moved to 14 Dorset Street, Lambeth, Surrey (now Dorset Road, Kennington) where he was a brewer employing 4 men & 4 boys. Details about Lambeth - 'The houses in the circus which, together with most of the others on the estate, were erected by John Snell of Dorset Street (now Road), builder, are simple well-proportioned two-storey villas with semi-basements.' (I believe this is Benjamin's uncle). Brewing seemed to have been a family business - In 1860 Thomas Bowyer ran the Stoke Brewery in Guildford and then in 1871 the Stoke Brewery was at 6 Woodbridge Road and was run by his Benjamin's father Thomas Chennell. The Chennells, like the Bowyers, were a local family of corndealers, maltsters and brewer. He first appeared in the trade directories in Newmarket in the 1869 Post Office Directory, but the following newspaper article announces that he actually arrived a year earlier. Opening Dinner at the White Hart Hotel.- The opening dinner of this establishment, on the occupation thereof by Mr. Benjamin Chennell, the new proprietor, took place on Friday evening last, the 13th inst., and was attended by most of the principal inhabitants of this town and a considerable number of visitors from Cambridge. The number of tickets was limited to fifty, at one guinea each, all of which were sold. The room was gaily decorated with floral devices, and had a very pretty appearance. The chair was taken by Mr. Challands, and the vice-chair by Mr. Jas. Manning, and on the removal of the cloth the usual loyal and preliminary toasts, including the health of the Duke of Rutland, were given, followed by the health of the host and hostess, received with many expressions of good will. The other toasts were - The town and trade of Newmarket, the Jockey Club, the Visitors, and the Ladies. 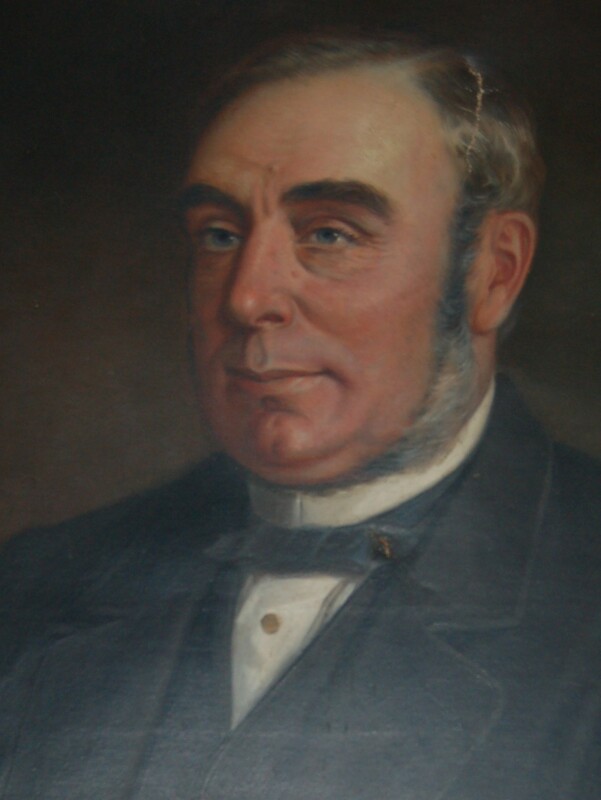 Mr. J. H. Stead, the original Perfect Cure, specially engaged for the occasion, contributed greatly to the pleasures of a very agreeable meeting, and many of the company assisted in vocal and instrumental music. The bill of fare was most luxurious, and the wines, including champagne, hock, sec, were highly praised. The company separated at a late hour. On 5th July 1869 Benjamin also had a 27 year lease of the Star and Garter Inn at Cheveley at £45 per annum, obtained from Mary Bottom (Charles' widow). 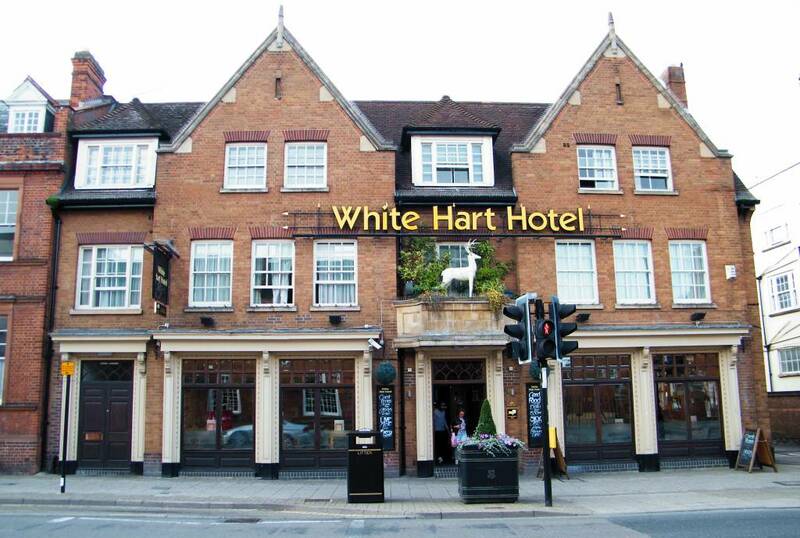 Transfer of Licence.- The licence of the White Hart Hotel, was transferred from Benjamin Chennell to Robert Layton. "FOLEY HOUSE" is let on lease to Mr. Benjamin Chennell, from the 1st day of February, 1877, for a term of 7 Years, at £150 per annum, determinable at the option of the Lessee, at the expiration of the 3rd or 5th year of the said term. In 1881 Benjamin was listed as living in Foley House as a Brewer, Malster, Wine & Spirit Merchant Employing 20 Men 2 Boys, and he stayed there for the rest of his life, being listed there on the 1911 census as a Retired Brewer. When Alfred Hayhoe of the Star Hotel, Newmarket went bankrupt in 1879 Benjamin was appointed trustee of the property. Benjamin seems to have obtained some status in Newmarket; as his name appears on a wall plaque as one of the Directors of the Newmarket Waterworks Company, which opened the Southfield Pumping Station in 1884 (brewing needs lots of water). It appears Benjamin retired in 1896; as from that point he's no longer listed at the White Hart after then. This is when Greene King & Sons Ltd. made their abortive attempt to buy both the White Hart & Moody's King's Head brewery and form the Newmarket Breweries & White Hart hotel Co Ltd, this soon fell through and the White Hart was sold to the Star brewery in Cambridge. 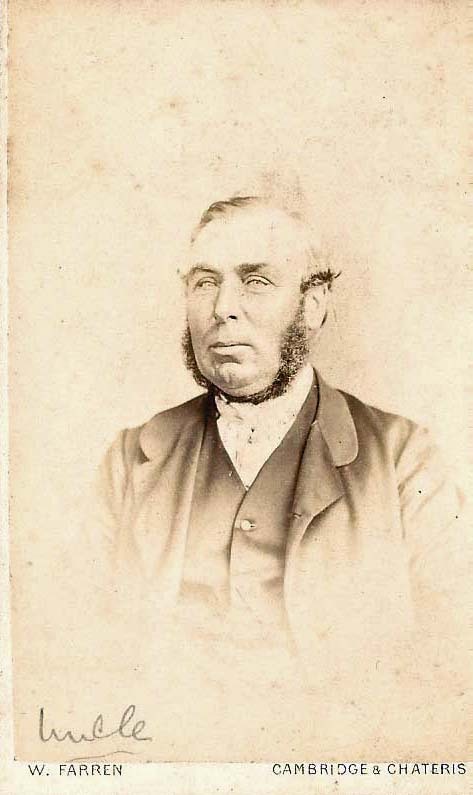 Benjamin's son; Fredrick Payne Chennell, was an auctioneer in Griffiths & Chennell in the High Street (presumably what later became Osmond E. Griffiths Auctioneers in Rothsay House). The partnership was dissolved on 5th October 1901. NOTICE is hereby given, that the Partnership heretofore subsisting between us the undersigned, Osmond Edward Griffiths, of Newmarket, in the county of Suffolk, and Frederick Payne Chennell, of the same place, carrying on business as Auctioneers, Estate Agents, Valuers, and Insurance Agents, under the style or firm of "Griffiths and Chennell"
was on the fifth day of October, one thousand nine hundred and one, dissolved by mutual consent. All debts due to and owing by the late firm will be received and paid by the undersigned Osmond Edward Griffiths, by - whom the business will in future be carried on.- Dated this nineteenth day of December, one thousand nine hundred and one. In the 1904 & 1916 Kelly's Directories Frederick was listed in the posting establishments (livery yards) in the Rutland Arms & White Hart Hotel. Benjamin died in Newmarket on 2nd March 1920 and his probate was heard at Bury St Edmunds on 28th April 1920. 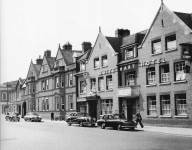 Born in Fulbourn, Cambridgeshire on 10th March 1823, Robert Layton was the licensee of the hotel from 1877, but he didn't stay there long as by 1891 he was back in Fulbourn as a farmer. In that same year Gertrude E. Barnes was listed as the hotel housekeeper in the White Hart on the census. William was an out-and-out landlord - born in 1864 in Chigwell, Essex, previously in 1888 he'd been listed as the landlord of the Black Bear public house, 12 King Street, Sudbury. Then in 1891 he was the landlord at the Sun Inn in Newmarket, before becoming the proprietor of the White Hart, appearing there on the 1901 census. On 14th January 1904 William Harvey Varrow declared himself bankrupt, but his problems didn't end there when on Saturday 4th June 1904 he was brought before the court at Cambridge and charged for offences under the Bankruptcy Act, and then again a month later on Saturday 9th July 1904 he was indicted at the Quarter Sessions at the Guildhall, Cambridge. 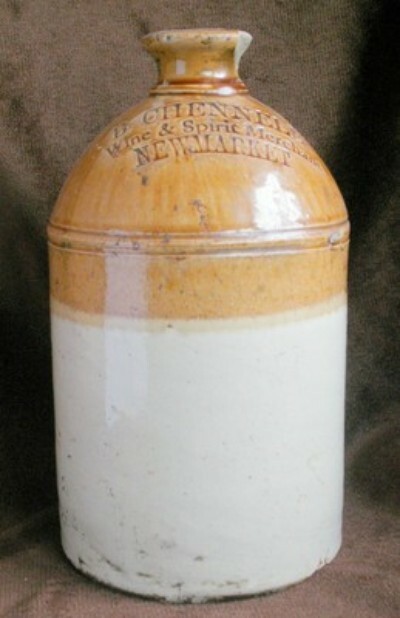 He was charged with having absconded a quantity of wines, crockery, glass, and other articles by train to Lavenham and Sudbury without declaring these to the official receiver. 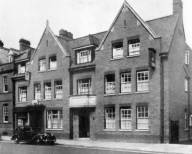 The order of prosecution was obtained by the Star Brewery Company at the suggestion of Mr. E. E. Wild, the then tied tennant at the White Hart Hotel. Auctioneer and valuer Osmond Edward Griffiths of Rothsay House - No.124 High Street was called to prove the value of the property. By the 1911 census Edwin was listed here as the hotel proprietor. Born in Wimbledon, Surrey in 1870 it's not known how long he stayed here, but by 1933 he'd returned to Surrey where he died on the 3rd November 1933 at the Roebuck Hotel, Richmond Hill. 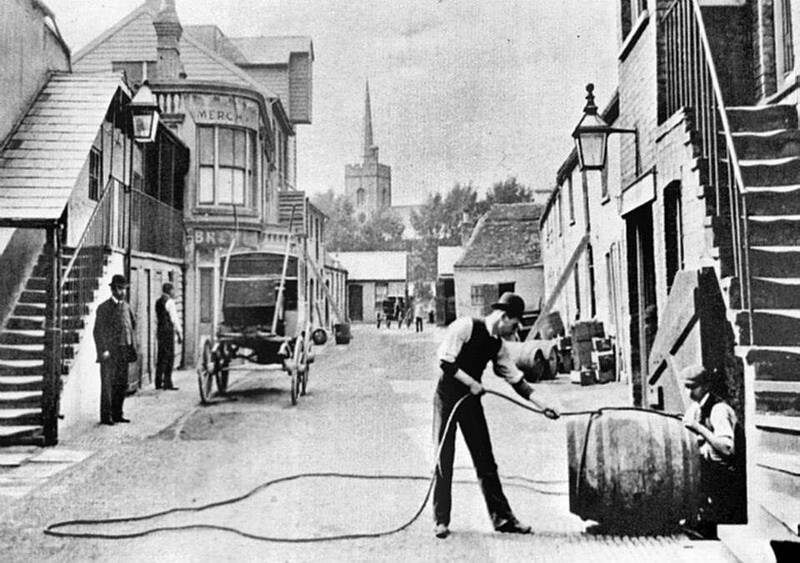 Many thanks to Tony Pringle for his information about the history of the pub and the photos 'The White Hart brewery yard c.1890', 'Horses in the High Street c.1895', 'White Hart Hotel c.1930' and the postcards 'White Hart 28-09-1912' and 'White Hart 6-12-1910'. 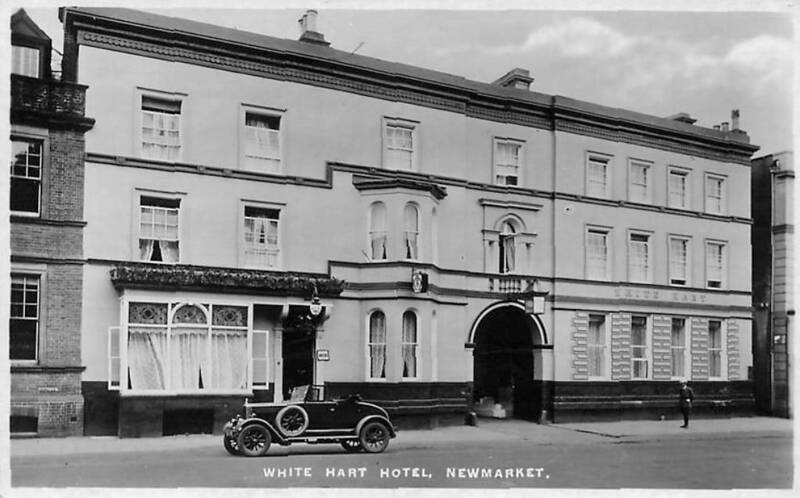 Many thanks to 'Old Newmarket' for the photos 'The White Hart c.1950s', 'The White Hart c.1960', 'The White Hart c.1960s' and 'The White Hart late 1980s'.